Sometimes grand, mostly utilitarian, staircase design has evolved over the ages with the latest trends indicating a preference for glass and stainless steel. Integrated into most homes as a functional necessity, staircases can be transformed from an average feature into the focal point of the home by adding elegance and style to the design. Current trends for custom stair systems encompass various elements of modern style, with stainless steel and glass viewed as a clean and sleek option. 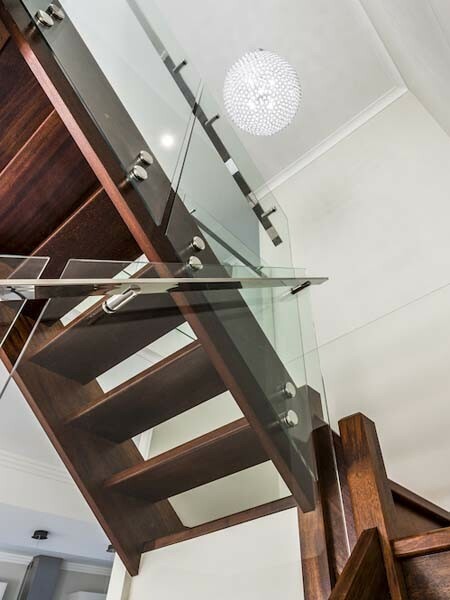 From new multi-storeyed homes to renovations of existing staircases, the use of glass balustrades and stainless steel handrails and fittings delivers sophistication and style, and adds to the overall visual appeal of the building. Glass and stainless steel are trending in contemporary staircase designs. Here are some of the advantages of using these materials in your staircase. Glass balustrade systems combine a modern sleek aesthetic with the functional advantage of allowing light to travel between spaces. The clean and clear glass finish is visually appealing, enables unobstructed views, and creates a sense of open space in the home interior. Stainless steel handrails and fittings deliver a fresh style with contemporary sophistication. Stainless steel is a high-quality, extremely durable material with alluring appeal. Stainless steel can also be welded into custom handrails to fit project requirements. Stainless steel handrails can be supplied in satin or mirror polish finishes. However, current trends lean towards mirror polish with its reflective shine adding a touch of glamour to the handrails. Miami Stainless is an Australian owned and operated importer and distributor of high quality stainless steel hardware servicing the balustrade and shade sail industries.